On Valentine’s Day, we announced the winner of our BIGGEST Instagram giveaway! And to show our love and appreciation to those who follow us, we gave away not just one, but TWO T580 hoverboards. 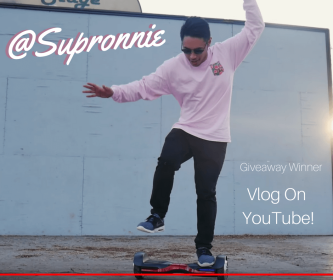 The reason we wanted to give away two hoverboards is that we wanted our winner to share their Swagtron experience with someone special! By following our page, tagging two friends and liking our photo on our Instagram giveaway post, Instagrammer and blogger Ronnie Sarmiento, was chosen at random and named the winner. Soon after receiving the hoverboards, Ronnie Sarmiento decided to surprise his girlfriend by giving her one of the T580’s he won. He happily documented their experience in a vlog which is now up on his YouTube channel! So, check out Ronnie and his girlfriend try their hoverboards by clicking the link down below!